Memory and Place, an exhibit of recent works by Columbia artists, Angela Bradburn and Claire Farrell will be held at Columbia’s popular art space, Gallery 80808. The gallery is located in the Vista Studios at 808 Lady Street in Columbia. Join the artists for a reception on Friday, October 5, from 5:30PM to 8:30PM. The show will open on October 5 and continue for 5 days until October 9. The gallery will be open from 10:30AM to 6PM on weekdays and 2PM to 5PM on Saturday and Sunday. The artists, Angela and Claire, are long-time friends whose work shares many common threads. Both work in a representational style, and their paintings include landscapes, figures, and close-ups of nature. 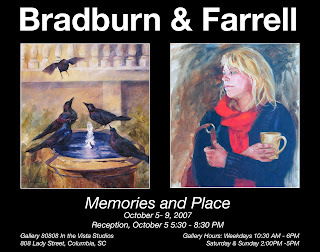 Bradburn works in both watercolor and oil, while Farrell’s work is primarily in oil and mixed media unique monotypes. The work of both artists reflects their love of nature and reveals their close ties to the world around them. The exhibit includes images of places, people and things as seen through the eyes of these two friends. To see a variety of work from the somewhat experimental to the very traditional, please visit this exhibit. Angela’s award winning paintings have received national recognition by taking best of show awards in both the Southern Watercolor Society and the Margery Soroka Memorial Award in the American Watercolor Society. She has been rewarded with signature membership in both the prestigious American Watercolor Society and the National Watercolor Society. Her work has been included in The Collected Best of Watercolor, Rockport Publishers, 2001: Best of Watercolor, Vol. 3, Rockport Publishers, 1999; Best of Watercolor, Painting Light and Shadow, Rockport Publishers, 1997, South Carolina Wildlife Magazine, March/April 1999. Claire’s work has been accepted in numerous national and state-wide juried exhibitions. She has received “Best in Show” awards in the Florence (SC) Statewide Juried Exhibition, South Carolina State Fair, the San Diego Watercolor Society Exhibit, the Friends of the Coast Exhibit in Charleston, the Waccamaw Arts & Crafts Guild Judged Show in Myrtle Beach, and the University South Carolina Alumni Art Competition. Additionally, she has received numerous awards of merit in a wide variety of exhibitions. She is a past president of the South Carolina Watercolor Society and her work is included in corporate and private collections nationwide. She maintains a studio at her home in Columbia, South Carolina. Both artists have recently launched new websites. To see more of their work, please visit them at www.clairefarrell.com OR www.angelabradburn.com. Free parking is available after 6 PM in the city owned lot diagonally across Lady Street from Gallery 80808…but access to this lot is off Washington Street across from the police station. To visit the website for Gallery 80808/Vista Studios, please click here.